Jenny Atkinson wrote in to ask if anyone had an idea what the item in the picture is. It seems too small to be a cup or a posy holder. Interesting item and at the outset I cannot identify what it is. I see the Durban motto is inscribed in the silver section round the Durban Coat of Arms. For those not knowing it, it reads Debile principium melior fortuna sequitur — Better fortune follows a humble beginning. Sadly today the coat of arms and the motto have been superceded by the Durban Dome which has become the Durban city “brand”. But back to your item. I see it is only about 50 mm high judging by your thumb behind it. 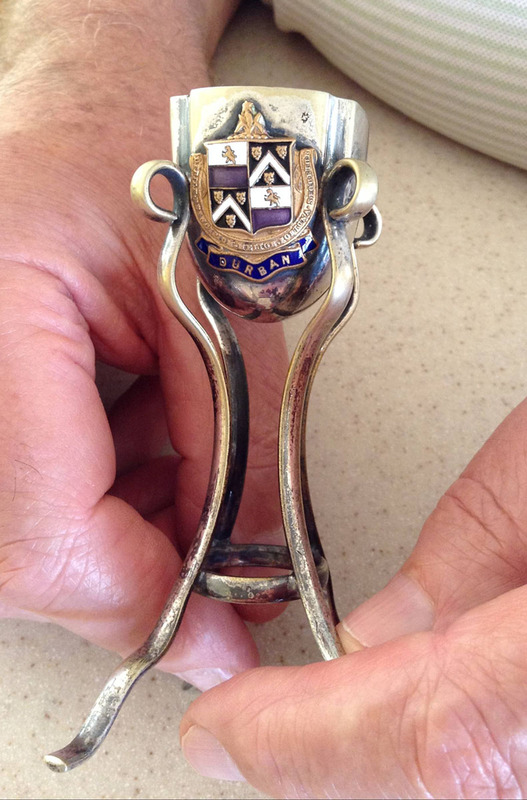 It looks too intricate to have been a trinket made for the local tourist shop such as a Durban keyring, teaspoon or egg cup. Not knowing the size of the the little cup, I would guess at it being some type of tableware for a formal dinner setting. May be a salt receptacle with the minituare spoon (missing) ? Any background as to where you got it? Was this not a snuff container? From the photo this item is pretty small. You would not be able to get your fingers in there to grab a pinch of snuff. Looking at it, the legs keep reminding me of a belt buckle, the pin that goes through the hole in the leather and bent into the shape you see. Jenny, the original poster has not come back with any other info so it remains a mystery. Intriguing though. PS ask your brother Guido maybe he knows! Hi Francisco. Yes, that is the Durban motto on Durban Coat of Arms adorning the object but we were wondering what the object itself is. It is hard to tell its use but at first glance it appears to be a model of a champagne bottle server used in restaurants to serve iced champagne or wine at ones table. Could be too big for a normal doll house sized model but might work in a larger setting as possibly made by miniature makers and collectors. The Durban shield added to make it a souvenir of some event or a prize given at a Durban event. I would like to find one myself! Hope that this is helpful? Could be a master salt in the shape of a champagne serves used in restaurants to serve champagne or wine at your table. The bowl would hold the bottle and ice to keep the drink cold. As a miniature this could have been made for a miniaturist’s restaurant scene but more likely as a souvenir or prize at some event in Durban possibly wine or champagne related. Like to have one myself! May have also held toothpicks or small forks on a table where snack or food items which required a toothpick to properly secure a condiment. .